[Image: From Power from the Wind by Palmer Cosslett Putnam]. 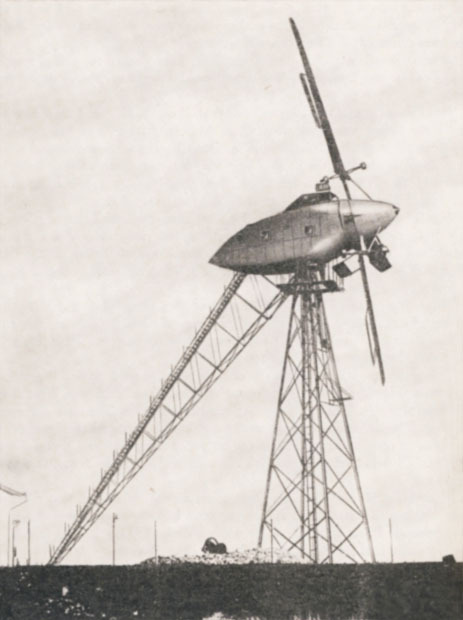 "In May 1931," author Palmer Cosslett Putnam wrote in his 1949 book Power from the Wind, and "after two years of wind measurement, a wind-turbine 100 feet in diameter was put in operation on a bluff near Yalta, overlooking the Black Sea, driving a 100-kilowatt, 220-volt induction generator, tied in by a 6300-volt line to the 20,000-kilowatt, peat-burning steam-station at Sevastopol, 20 miles distant." As if anticipating BLDGBLOG's recent look at infrastructural domesticity, Putnam points out that "a streamlined house" containing generators was held aloft behind the turbine – but this "house" also offered a temporary place of rest to the maintenance workers who checked up on the turbine's workings. Accessible via a long flight of stairs, this airborne space added a small touch of domestic comfort to an otherwise industrial piece of machinery in the sky. [Sent in by Alexis Madrigal, who also had this image scanned from Putnam's book]. It looks like a giant propeller, with a pretty dramatic staircase. Not a bad find. Although its tough to imagine something like this being too domestic. It reminds me of something I just saw on into the loop. I am the inventor of a wind power system using static airfoils. Power Towers can demonstrate that wind power is the way forward and knowing the effort that you are placing on wind power, this project may interest you. I envision these twin slender skyscrapers size towers that can used as both habitable structures and power generating towers. They would have a kidney airfoil shape and produce 50 MW of power. These slender towers would be wild life friendly and will use 1/10 the land needed by horizontal turbines. I have discovered a means of producing electric power from the wind that is many times more efficient then the horizontal turbines now in use. My patent pending wind machine will power the 21st. Century! Imagine a 50 MW wind power plant that is operational 100% of the time. There will not be need to cover Michigan with thousands of ugly wind turbines. The cost of wind electric energy must be reduced to below $.03/ kWh. and made more reliable in order for wind power to become competitive with coal. My discovery is an innovative machine using static airfoils. Rotors produce power proportional to the diameter squared. My patent pending invention produces power from the wind not by increasing rotor diameter to immense sizes but by increasing the wind velocity, and since power is proportional to the cube of the velocity you immediately see the advantage. A wind tunnel test was done this fall semester at University of Michigan. This test confirmed my calculations, and will provide data to direct my next steps.The importance of this project can not be minimized. Imagine how the world will change if the world knew what I know about wind power and its abundance. Big up to the mad scientist! I sincerely hope that Mr. Frank's plan will change the world. The inhabitable wind turbine seems to be something of a lets-combine-two-elements-not-normally-found-together-and see what it looks like approach, which is valid enough (Antony Gaudi, Droog Design, Paul Simon). It does however require some degree of moderation. I feel like this one is unlikely to take off (har har) as theres simply no point, no substance. Anyway, good to know that there were showboaters in the 1930s too.